The Democratic Gathering bloc which is headed by MP Walid Jumblatt will meet at 5 p.m. on Sunday at his residence in Clemenceau to discuss its stance on the parliamentary consultations scheduled for Monday, LBCI TV and MTV reported on Saturday. Jumblatt who is in Syria today was reportedly pressured by the Syrian president Bashar al Assad to side with the candidate of the Hezbollah-led opposition during the parliamentary consultations. 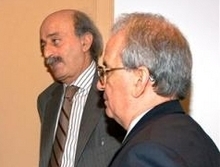 According to local reports Jumblatt was planning to to tell the Syrian authorities that he cannot convince all the members of his Democratic gathering bloc to vote for the PM candidate of the opposition and for this reason he is working on a compromise during the parliamentary consultations to delay the designation of a new prime minister with the aim of returning Hariri as the head of the government. Lebanon Files reported that Syria is insisting that the majority of Jumblatt’s MPs should vote for the opposition candidate . …They want Jumblatt to name 8 of his 11 member bloc to vote for the opposition. Prior to heading to Damascus , Jumblatt met with Caretaker PM Saad Hariri . Hariri according to sources told Jumblatt: “They want me to surrender and present concession after concession … on top of that they have a gun pointed to my head,” he was quoted as saying. Hariri also reportedly told Jumblatt that the opposition cannot be counted on in respecting agreements, as proven through its violation of the Doha agreement when the opposition ministers resigned from Cabinet.